Hi there! I'm popping in this morning with an entry for the Paper Players colour challenge and the CAS on Sunday challenge to use flowers. I'm using more of my new Altenew goodies. I paired the Doodle Bloom leaves with one of the flowers from Vintage Roses. I am in awe of how much depth and dimension you end up with using those 3 part stamps. So gorgeous! It took me a couple of tries to get used to lining them up but it was worth the effort. I can't wait to play with these some more! The dimension and depth are unbelievable. Looks like it will pop off the page. Gorgeous Jen! I just want to reach out and touch that flower Jen! I love the contrast with the open lined leaves! Wow, that rose is SO realistic! I will need to check out those stamps! Beautiful creation...clean and fabulous! So glad you shared this with us at the Paper Players this week! What an amazing rose!! 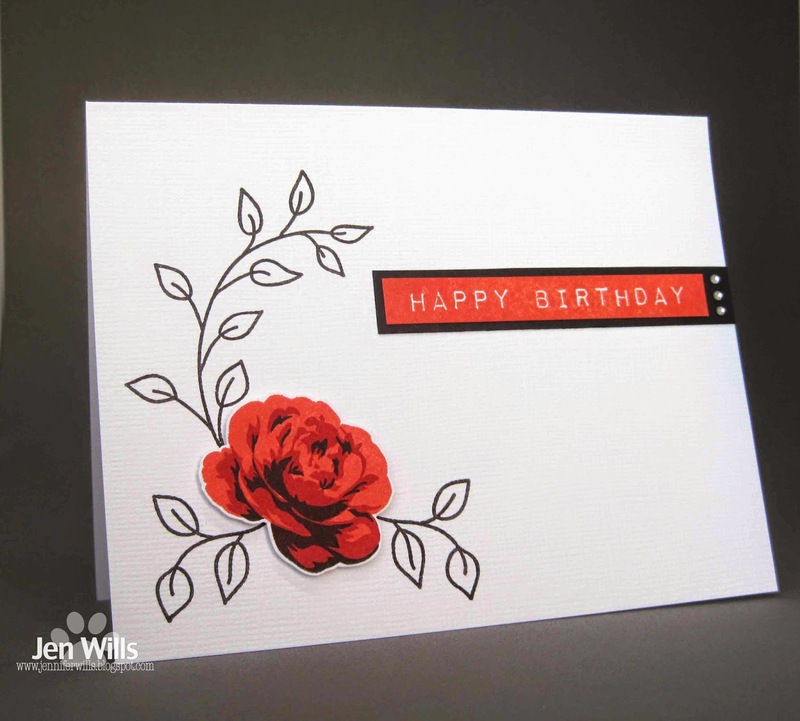 This is one beautiful card Jen!! Okay, wow! It's hard to imagine that rose is stamped and not some kind of photo sticker. Gorgeous! LOOOOOOOOOOVE this!!! SO. Much!!! That rose looks like a photo and I just love how you have juxtaposed it with that simple stencilled leaf. You rock! You really, really do!! Wow Jen that rose is so realistic - it looks gorgeous against the clean white background. A fabulous card! 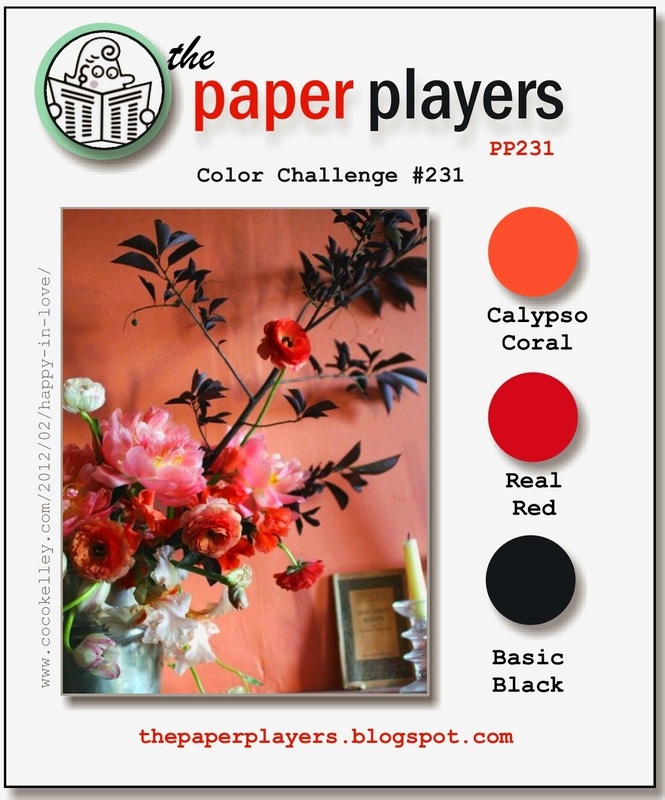 Thanks for joining us for our colour challenge over at the The Paper Players this week! Simply, beautiful! Thanks for joining us at CAS on Sunday! AWESOME pop of color...this one is a winner in my book! OOOOh Altenew stamps! So pretty! Love the flower image! Love the contrast between the style of the leaves and roses. And between the white with the red and black. I agree that the 3 step stamps give a really beautiful effect.